The government is listening to the trade unions but will not change its deficit-cutting strategy because of Saturday's march, Vince Cable has said. The business secretary said the coalition was "one of the strongest governments" the country had ever had, dealing with a financial crisis. 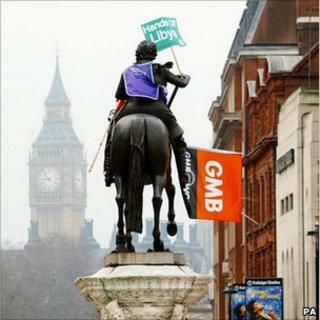 The TUC said 250,000-500,000 people attended the anti-cuts march in London. It condemned violence which broke out alongside the protest, leading to 201 arrests. Two people have been charged. Of those arrested 199 were still in custody on Sunday afternoon, the Metropolitan Police said. The Met said 145 of the arrests were in connection with a demonstration by campaigners UK Uncut, which occupied luxury grocery store Fortnum & Mason in Piccadilly in protest over alleged tax avoidance by the business's part owners. The force has faced some criticism of the way it handled the protest, with former Met Deputy Assistant Commissioner Brian Paddick saying officers should have done more to protect property. But London's deputy mayor Kit Malthouse said officers had a "difficult balance" to strike between policing the main demonstration and unrelated incidents of violence including attacks by anarchist groups. The two men charged have been released on bail ahead of court appearances. A 17-year-old from Manchester has been accused of possession of an offensive weapon and going equipped for criminal damage, and a 31-year-old from Glasgow has been charged with violent disorder and assault on police. The coalition government aims to eliminate the deficit over four years through a combination of spending cuts and tax rises - Labour had planned to halve the deficit within four years, if they had won the election. Liberal Democrat minister Mr Cable told BBC One's Politics Show "difficult choices" were having to be made, but the coalition government was "one of the strongest governments which this country has ever had, facing a major financial crisis". He said making fewer cuts, or over a longer period would mean the government having to borrow more - something that had become "very difficult" because of what was happening in financial markets and in Europe. He said deficit was being cut on a "sustainable basis". "Of course there's pressure on living standards, the reason for that is we are now a poorer country, the GDP fell by over 5% in the financial crisis, now that was temporarily absorbed by government borrowing, that was not sustainable. It's now being felt by the public at large - it is painful and it is difficult." Mr Cable said the government was "listening" to the trade unions but added: "We're not going to change the basic economic strategy. "No government - coalition, Labour or any other - would change its fundamental economic policy simply in response to a demonstration of that kind." He acknowledged that there were disagreements within the coalition on some issues - including, as the Observer reports, unhappiness at some aspects of welfare reform - but such issues were usually dealt with in a "business-like way" through the coalition process. And he said he was "pretty sure" the coalition would survive if the referendum on the alternative vote on 5 May resulted in a "no" vote. The Conservatives offered the referendum as part of their coalition deal with the Lib Dems, who have long campaigned to change the UK voting system. Mr Cable added: "We are a grown-up party, we have not thrown our toys out of the pram because things happen we disagree with. I think you will find the approach to this whole thing is a very mature one." Saturday's rally was peaceful, but small groups attacked shops and banks, and later there were clashes between police and protesters in Trafalgar Square. TUC general secretary Brendan Barber said there had been a number of people "separately from our march and rally... clearly intent on destruction and violence". But he said the march had been "good natured". He added: "I don't expect the government to suddenly announce they're going to make a U-turn because of an event like this, but they are going to have to start reflecting pretty seriously. This was Middle Britain on the march yesterday. "I think the tide of opinion is really flowing very heavily now against the government's strategy. "As these cuts really bite over the next few months, the reaction I think around the country, the real hostility to what the government are doing, is going to grow and get even stronger. "And when the people speak, governments have to listen." Meanwhile Labour figures have defended party leader Ed Miliband over his speech to the rally on Saturday - there has been some criticism about his claim that the marchers came "in the tradition" of the suffragettes, the US civil rights movement and the anti-apartheid movement. Shadow defence secretary Jim Murphy said: "Ed has said these were different causes at different times. The size of the demonstration yesterday was enormous and it was a reflection of the comparison of scale."